Movie Beards: Executive: "Batman Forever"
The first post-Burton beard in a Batman film belongs to the face of Michael Paul Chan. You may remember Chan as the father of Data in The Goonies, a movie that, unfortunately, has not a single beard. Chan is credited as an "Executive" who presumably works at Wayne Enterprises. The Executive uses the power of the well-groomed Business Beard to keep things at Wayne Enterprises running as smoothly as possible after the apparent suicide jump of Frank Stickley (Ed Begley Jr.). Frank had every intention of terminating Edward Nygma's new brainwave manipulation project. Nygma unpolitely disagreed by absorbing Frank's mind and sending him out the window in an office chair. The next day, he forges Frank's suicide note and hands it to the Executive, stating that the "handwriting matches his exactly, as does sentence structure and spelling." The Executive uses the Business Beard and his presumed expertise in handwriting analysis to confirm this statement and gives the note to Bruce Wayne. Case closed. Thanks, Executive! 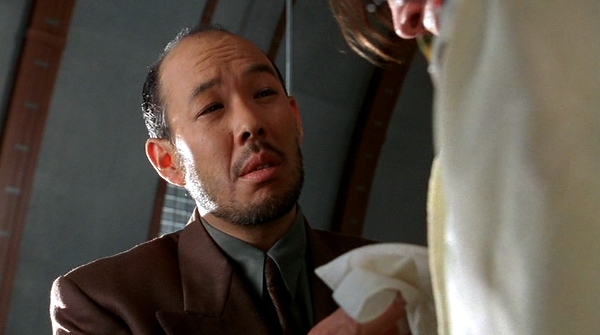 I bet you a Coke that this isn't the last we see of Michael Paul Chan this month. Seriously, you're gonna owe me a coke. It'll cost you 85 cents.